Designed by the newly established architecture firm Affect Studio (based in Los Angeles and Berlin), Japanese Izakaya restaurant Hashi Mori, which translates as “Chopstick Forest”, is located on the ground floor of a modern steel and glass multi-use building — one of thousands that have filled in Berlin’s blanks in recent years, between time-stamped pre-war apartments and cement GDR high-rises. We were drawn to this restaurant as it follows a very similar style of ceiling design to the exquisite Ametsa with Arzak instruction, and its roof covered with hundreds of spice tubes. 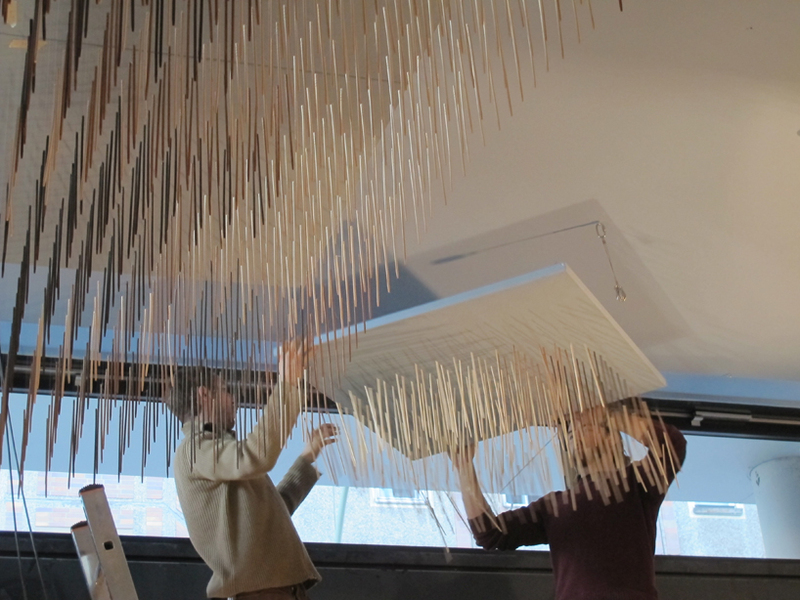 The vertical lines of the wallpaper complement the vertical lines of the restaurant’s centerpiece: its 56 square meter ceiling installation made of 13,454 hand drilled, stained, and threaded chopsticks, 57,400 knots, and over 20 kilometers of nylon. 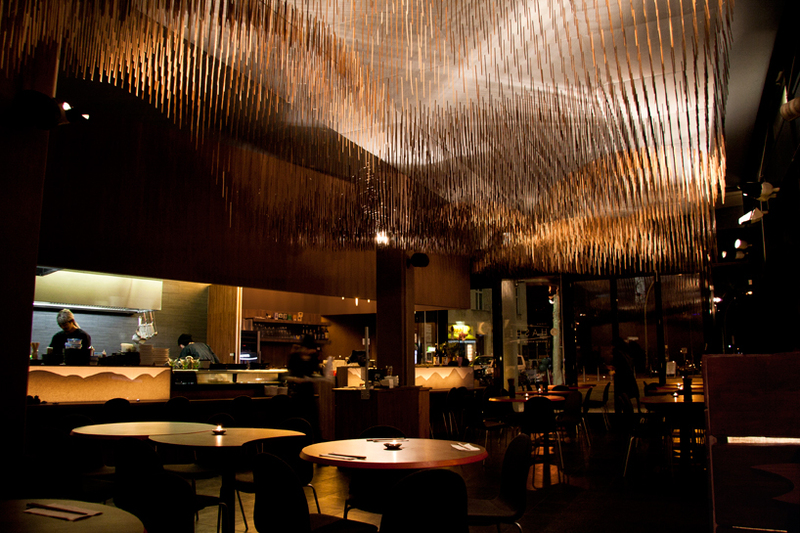 Installed by a crew of 14 people taking 3 weeks to complete, this “undulating” chopstick canopy creates a ‘swaggering cloud’ and an incredibly literal insignia for the restaurant. 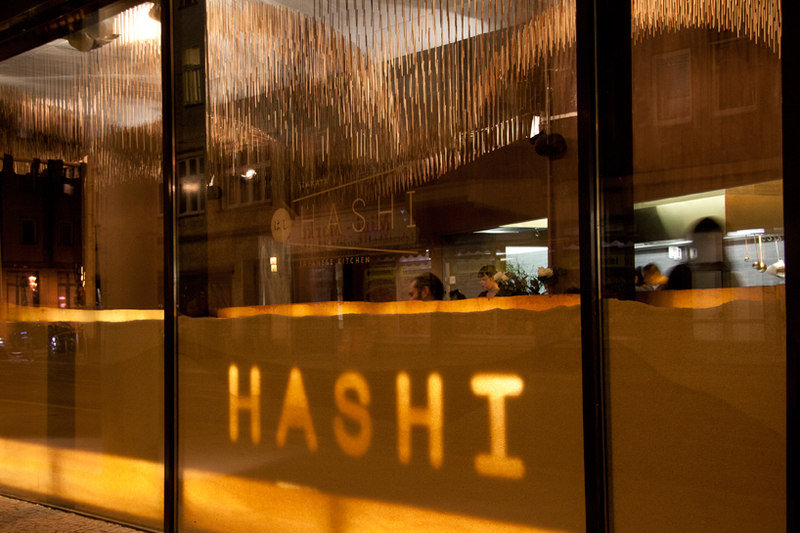 Hashi Mori’s design gives character to this otherwise faceless edifice: from the other side of the street, one notices the restaurant’s bar and exterior façade, which are filled with half a ton of Japanese rice and backlit to cast a diffused glow both inside and outside its doors. Traditional materials and handcraft are mixed with 3D modeling and computer programming to create an atmospheric space for dining.